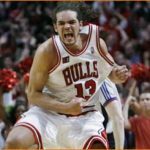 Just as the Florida Gators were celebrating their Sweet 16 victory in the 2017 NCAA Tournament early Saturday morning, The Vertical‘s Adrian Wojnarowski reported that New York Knicks center Joakim Noah will be suspended 20 games for violating the NBA’s anti-drug policy. Noah tested positive for an over-the-counter supplement that is prohibited under the outgoing Collective Bargaining Agreement, league sources said. Noah, 32, is expected to serve 10 games of the suspension to finish out the 2016-17 regular season and 10 games to start the 2017-18 season, league sources said. The National Basketball Players Association’s investigation concluded that Noah hadn’t “knowingly or willingly” violated the policy and cooperated fully with the league’s probe, league sources said. It’s been a rough season for Noah as he joined his hometown team of the Knicks. He’s dealt with a variety of injuries all season and averaged just 5.0 points and 8.8 boards per game while shooting a career-low 43.6 percent from the charity stripe. He underwent season-ending knee surgery on Feb. 27 and will enter the 2017-18 campaign in the second year of a four-year $72 million contract.